Technology moves at a lightning pace and nowhere is this more evident than in the cell phone industry. Today’s latest and greatest smartphones quickly get obsoleted and there’s no end in sight to the upcoming devices that vie for your attention. Some people call this phenomenon a fad, others blame it on Android carpet bombing. It is surprising then that a reputable survey has found out that prospective smartphone buyers are still lusting after the six month old iPhone 4S. Specifically, nearly six out of ten want Apple’s device. Mind you, six months is an eternity in the smartphone space. ChangeWave Research, a division of 451 Research, is out today with an interesting survey (via Fortune) based on a poll of 4,413 consumers, primarily early adopters from the United States. These are the people who know their gadgets inside out and won’t settle for anything but the best device the money can buy. Knowing this, it’s surprising that a whopping 57 percent of respondents who plan to buy a smartphone in the next three months are eyeing an iPhone. That’s a healthy two percentage points increase over ChangeWave’s previous research conducted during the holiday shopping season, shortly after the iPhone 4S got released. 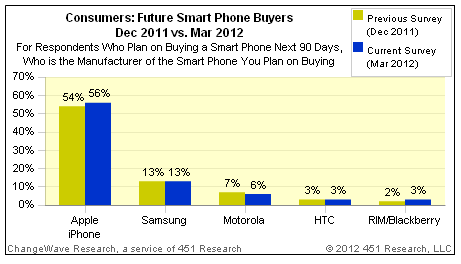 During the same December 2011 – March 2012 period, demand for Motorola handsets decreased by a single percentage point. South Korea-based Samsung remained flat at 13 percent. No Samsung, your anti-Apple campaign isn’t working. Surprisingly, Research In Motion actually recovered a point to score three percent. If that didn’t blow you out of the water, you should know Apple’s 56 percent is the second highest score ChangeWave has ever recorded. Now, the effects of Apple’s entrance into the mobile market in 2007 are painfully evident when glancing over the Apple vs. RIM demand chart below. 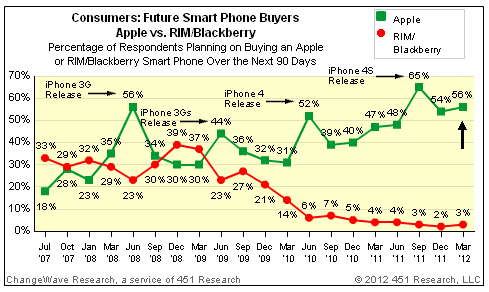 RIM held onto its share pretty much throughout the original iPhone and iPhone 3G release. But Apple really hit the sweet spot with the iPhone 3GS release in June of 2008 and it’s since been pretty much a downhill ride for the BlackBerry maker. Similarly, ChangeWave found out in December that 96 percent of respondents were satisfied with their brand spanking new iPhone 4S. Apple being the top dog in customer satisfaction matters a lot because customer satisfaction is the key metric with technology we keep in our pockets and turn to a couple dozen times a day. Not sure about you, but I find this survey pretty surprising, can’t say I saw those numbers coming. To me, the fact that a phone which on the outside looks the same as its predecessor is still capturing the attention of early adopters at the expense of shiny new devices from other vendors is simply mind-boggling. And I think we can all thank Siri for that. If it weren’t for her, those numbers would no doubt have been drastically different today. 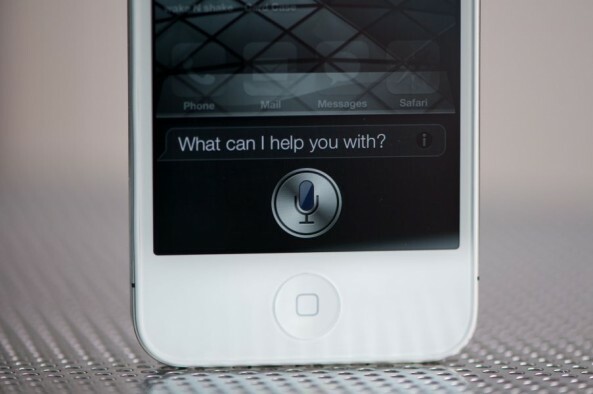 Do you think Siri is the only reason why so many future smartphone buyers are considering an iPhone?